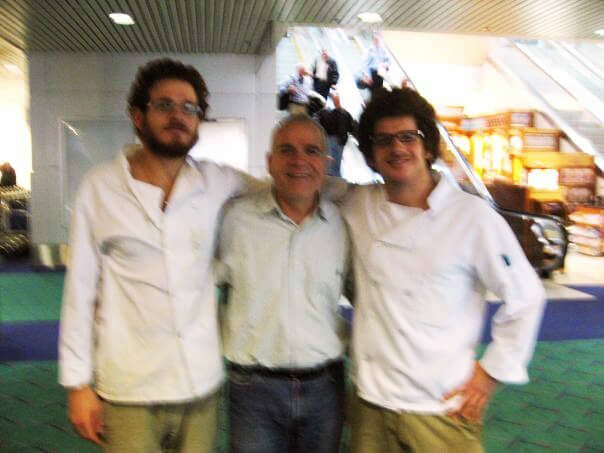 The three founders of Off The Waffle, Omer (Left) Shimon (Dad, middle) & Dave (right). Peep the power of love & support: This photo was taken in 2010, and we had just opened the doors of our house to sell Liege waffles – We had no idea what we were doing. It is truly awesome to be working as a family business and we make it a point to share those same values with our Team and our Customers. We (brothers Dave and Omer) grew up traveling around the world, and as kids we spent time in Belgium. One of Omer’s first memories is of receiving a delicious Liège waffle from his kindergarten teacher in Brussels after a full day free of him causing a ruckus. Since our departure from Belgium, we obsessed over Liège waffles and the possibility of making our own some day. In 2009, we spent time zig-zagging through Latin America and at some point realized that we would soon run out of cash, so in an effort to save up for another round of traveling we flew to San Francisco to begin looking for work. We bought a Honda Prelude for a $1,000 and started driving north. We really had nowhere in mind but our gut (our guts?) told us to stick with where we liked and that was the Northwest. At some point we found ourselves in Eugene and immediately fell in love with the area and the community. We started experimenting with our waffle recipe and shortly thereafter, we settled down in a little orange-and-yellow-painted house in the West Jefferson neighborhood. It was out of this house that we finally opened the original Off The Waffle. We spent about a month crafting signs, spreading the word, preparing the shop and developing the recipe (which is always in the works). It wasn’t long until we were joined in our waffle shenanigans by Shimon (our dad and longtime waffle enthusiast) and Vered, our little sis. Along with our crew of world-class waffle bakers, we continue to serve waffles that make you want to hug someone. Nevertheless! We are still just babies in the restaurant world, and we do not claim to have it all figured out. For this reason, it is crucial that you give us as much feedback as you can to help us make more waffle lovers happy. Feel free to contact us at any time by phone or email (holler@offthewaffle.com) Thanks, and enjoy the ride! Off the Waffle comes to Portland, and brings the whole family – here we are with our dad Shimon! People loved us, we needed more space. Off the Waffle Downtown is born! Our first official restaurant opens in South Eugene – we are really excited. In the spirit of Eugene, we offered waffles for trade – and encouraged other to do the same. Check out our Barter Wall. Our first location in the old Van Buren House, which we rented. We were selling waffles out of our living room and handing out samples at weekend markets. Your waffles have arrived! Now What? Keep them in the freezer for optimum freshness. - Our waffles are considered a non-potential hazardous baked good. That's fancy-smancy Health Department talk for goodies that are safe to leave out at room temperature with no threat of bacteria growth. However,we have found that a waffle left out at room temperature for more than 6 days can get stale. So, our best advice is that you store your waffles in a freezer as soon as you receive them.